It was disapointing to staff that the first move of the new Clarion housing association was to raise the threat of union derecognition for staff in Circle Housing. It is no surprise that 98% of Unite members in Circle voted for industrial action in our recent consultative ballot. After many years of positive relationships with unions at Circle the new regime moved to derecognise unions just before the merger was formally agreed. Staff are naturally anxious about changes in the pipeline as to the two organisations are brought together, and consider this the worst possible time to disrupt channels of communication between staff and management. Clarion management now says they are willing to work with unions and are surveying staff across the two organisations, but the way the vote was introduced without prior discussion or consultation and the nature of the question asked does not suggest a real wish to work with unions. Unite is fully committed to stand by its members in the former Circle housing part of Clarion who clearly wish to maintain union recognition. Unite members and staff reps at Affinity Sutton have also expressed their desire see full union recognition so that their collective voice is properly heard. Unite is keen to work with Clarion in a positive manner but will figtht for union rights in Clarion if management is unwilling to engage. Union members have already launched protests and this will escalate if neccessary. 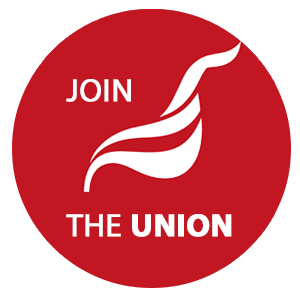 "Unite in Clarion: we are stronger together"
Management want to de-recognise the unions, reducing the unions’ ability to represent the collective interests of their members. Hours of work, including any flexitime or flexible working arrangements. Over the last month we have spoken to members angered by Clarion’s attempt to de-recognise the previously recognized unions in Circle. New members have joined Unite and become involved in the campaign. CONSULTATIVE BALLOT RESULT: Unite, with Unison and GMB, held an indicative ballot for industrial action across its former Circle membership in order to inform the unions’ next step in the dispute. 98% of Unite members voted for industrial action: a clear mandate to take forward the campaign. STAFF SURVEY: Though we challenge the validity of the survey and in particular its attempts to pit the recognized unions against each other, we have agreed with sister unions to urge you to vote YES for union recognition, giving us collective bargaining rights over pay, terms and conditions.